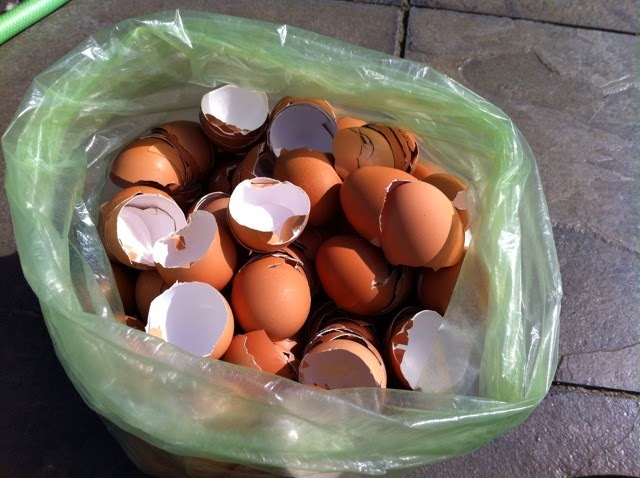 Queen Composter shares how she uses egg shells in her garden. We save every single egg shell that we generate and now I have a fairly sizable bag. I have read many blog posts on the multiple uses of egg shells, such as growing seedlings in them, and using for a calcium boost in smoothies. I use them in two particular ways for gardening. I crush egg shells and scatter them around my young plants to protect them from snails and slugs. I grind them up and use them as a calcium supplement for my tomato plants. 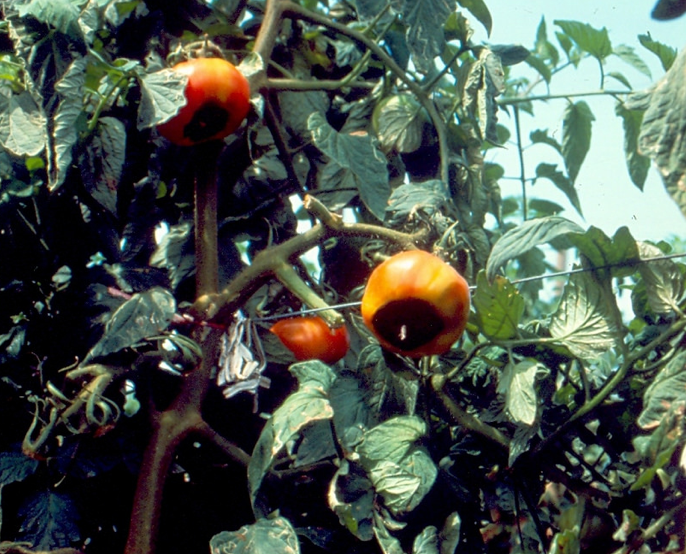 Tomatoes are prone to a problem known as blossom end rot, which is when the bottom on the tomato, where the blossom was originally, begins to rot. This is due to a calcium deficiency, which eggs shells can alleviate. Last year I grew my own tomatoes from seed, but to guarantee homegrown tomatoes, I bought some plants to supplement what I grew. My tomatoes from seeds produced fewer tomatoes because I started them late, but they did not suffer from blossom end rot as my store bought tomato plants did. The main difference was that I added egg shells to my own plants. 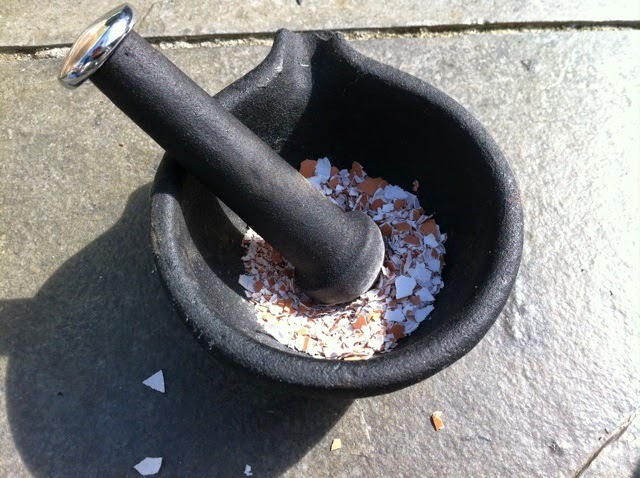 I grind egg shells up in to a powder-like consistency using a mortar and pestle. Some people use coffee grinders to obtain a very find powder, but I enjoy the low tech method of grinding by hand. 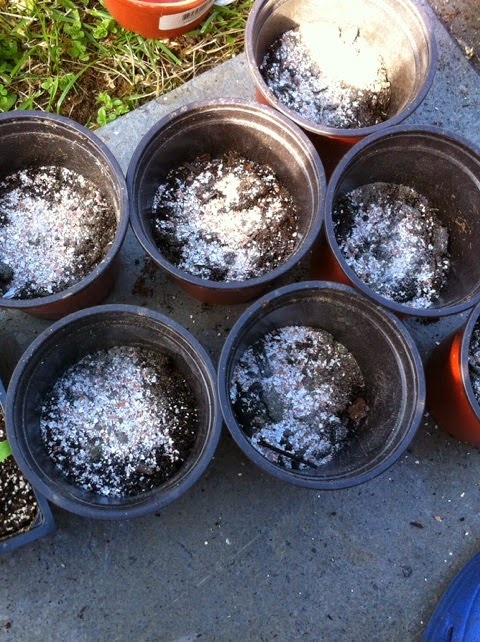 When I transplant my new tomato plants as young seedlings, I add some of the egg shell powder to the soil before I add the plants. 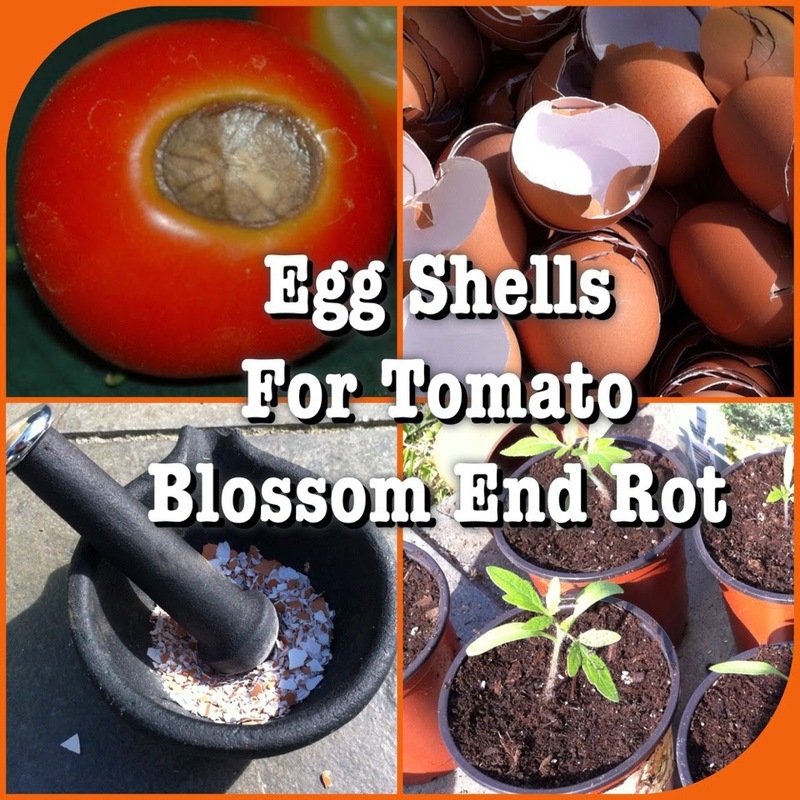 It is important to have the egg shell powder in the soil near the roots. 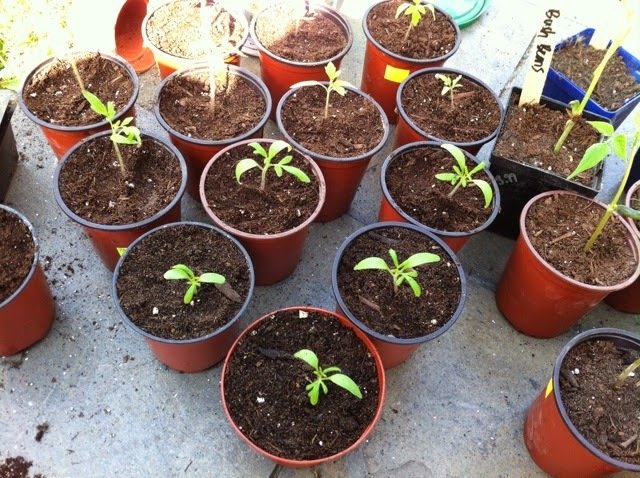 When it comes time to transplant these young tomatoes into larger pots I will repeat this process and add more egg shell powder. There are commercial fertilizer mixtures that add calcium to the soil, but I love this cheap and easy method. I know what I am putting in my soil and it is free of synthetic fertilizers. My bag of egg shells is quite large, so I would love to learn more ideas for using them. Do you have any to share? I crush them and give them to our chickens. They need calcium to make strong eggshells, and while you can give them crushed oyster shell from the feed store (and I do when I'm short on eggshells), crushed eggshells are free and work just as well. I also put some around my tomato plants, when we have them. I crush them up and keep them in a jar, so they're ready to go and take up less space to store. Do you wash the shells before storing them?? Do you ever have a problem with culturing Salmonella? I love this idea, I normally add the shells to my regular compost, but was concerned with proper storage? Any thoughts?? Helena, that's a good idea to have some precrushed. I'm jealous you have chickens; we aren't allowed any on our lot size due to by laws in my area. Alisa, I do wash and leave them to air dry before storing them. I make sure to rub my thumbs around the inside to clean them out as much as possible. Other than that I don't do anything special.